Frosted Primrose is a delightful, one skein project – perfect for that single skein of aran weight yarn that you just had to have. The pictured sample is knit using a single skein of Madelinetosh Tosh Chunky is the stunning colorway, Alizarin. I just had to have Alizarin! Frosted Primrose fits an adult head size of approx 21” – 24” (53.5 cm – 61 cm). The blocked circumference measures approximately 26” (66 cm), while the length is approximately 10.5” (26.5 cm). As always, this downloadable, PDF pattern has been professionally tech edited and test knit to reduce the potential for error. The stitch pattern is charted, but the pattern features complete written line by line instructions so the ability to read a chart is not necessary to work this pattern. There aren’t any difficult stitches, yet there is enough variation in stitches and techniques that you shouldn’t be bored. So, what are you waiting for? Go stash diving. Find that lovely, coveted single skein of aran weight yarn and get knitting. 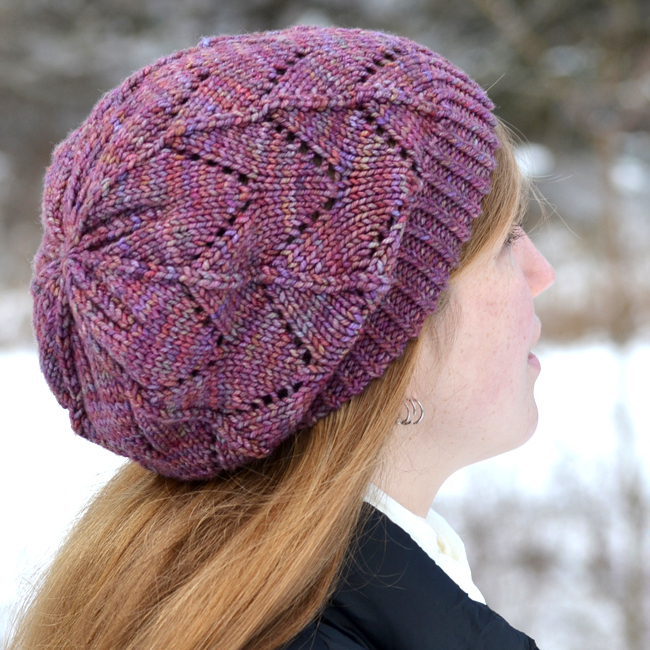 In an evening or two, you will have a fashionable, cozy hat to show off that gorgeous yarn! Full pattern details for the Frosted Primrose Hat can be found here.